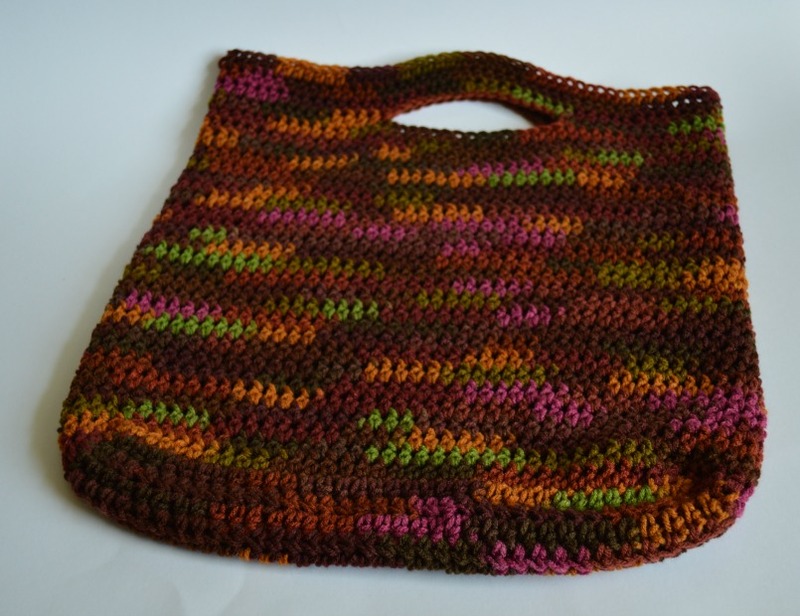 Don't have any variegated yarn? I buy yard sale thin yarn cheap and mix two or three different colored strands. Works great and is sometimes even a "give away" from friends who had the leftover older thin yarn. Seriously, I'm pretty sure we're long-lost siblings... I'll hang in there, if you will too! This is a great "just sit and crochet" project. Mindless and perfect paired with a late-night movie! Oh man how I wish blogger had a like button. I thought the same thing when I read this post. 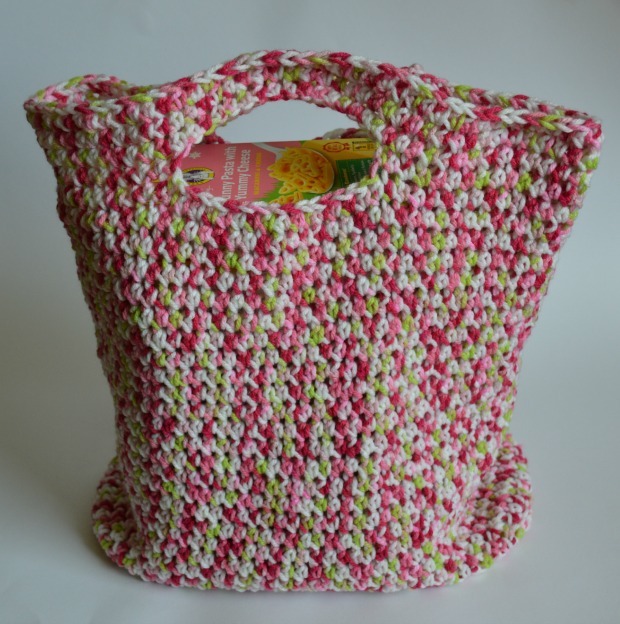 Hi There, This pattern looks easily enough even for me to make and what a stylish shopping bag I'll have!!! Thank you!!! Hi Janet!! Thanks so much. I'm glad you liked the new book!!! I think that cotton yarn would work great! The bag would be a little heavier than if you used acrylic, but I think that would be the only difference. Works up great in the cotton yarns. It is a little heavier but I feel like it is more sturdy, and it came out great in Black and hot pink. Thank you for the easy instructions...I am a youtube crocheter.....I have to see how to.....this was the FIRST craft I have made with just written instructions! AWESOME turn out! I love the Market Bag! I can't wait to make another one! Anonymous, I found that issue with the pattern too, the handles being not centered on the front and back so I just started counting from one side...15 st, ch 15 , sk 15 and then it was 15 to other side seam (45 st). As for the seam , I did it in continuous rounds so I didn't get the seam, but I wouldn't recommend that either because my handles didn't line up right with the spiraled row and I had to manipulate it to work a couple times, so go with the slipped seam it shouldn't be so noticeable on the side anyway. I love this bag and I'm amazed at my first attempt how well it turned out. has anyone tried this with plarn ? ? I was thinking that also!! I was going to try it and see how it worked out! PDunn56....thank you for responding. :) I'm glad I wasn't the only one that happened to. I kinda played around with it also and got my handles somewhat centered. I was pretty happy with it too when I finished. I just started this bag and can't figure out how it becomes a bag! 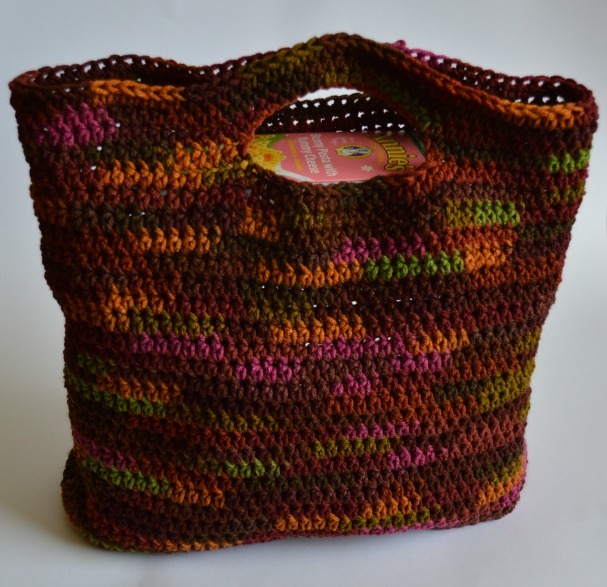 Do you crochet in the back loop only of round 11, and that's what makes it start forming a bag? Cause right now all I have is a rectangle. Can wait to make this bag. I'm am going to make it from Plarn. (Recycled grocery bags converted to plastic yarn.) Keep those plastic bags out of the land fill by repurposing. This pattern is just what I was looking for - so I have included a link to it in my blog - http://alittlebirdmademe.com/2013/08/09/friday-finds-a-list-of-21-links-to-free-patterns-for-crochet-market-bags/. Can you please confirm that I am to crochet into the spaces on round 1, then only the stitches after that? Having never made a bag before I was well impressed with how it turned out. Do you have any scrap wool patterns? I have made bags before with yarn made of old grocery bags (cut in rounds and chained together). This is a better pattern. I can't wait to try it. The ultimate recycling project. Looks great... I can't wait to try this!! Do you count the chain stitch as one of the 90? Row 36 does not line up right. My handles end up on the sides instead of the middle. What change to the pattern did people make to correct it? Thanks! This would be good in plarn for the beach! June 26, 2014 I really liked this pattern, I have made 2. The second one the person asked if I could make the handles longer, which I did, and it turned out beautifully. Could you tell me where you got your Cherry Cola yarn, love the way it worked up. Amazon does not have a free download for your book after a short period of time you must pay for the site. This is the first time I've "commented" on a pattern. This one is just great and I do use only my reusable bags for groceries. These will be Christmas gifts. Thank you! In answer to the stretchability of the bag, it is easy to make a cotton liner and stitch it into place below the handle. I use worn out sheeting, lengths of denim from old jeans, flannel from torn shirts. Everything has a re-purpose eventually. Lighter weight material makes great liners for purses so combs and pens don't work their way out.